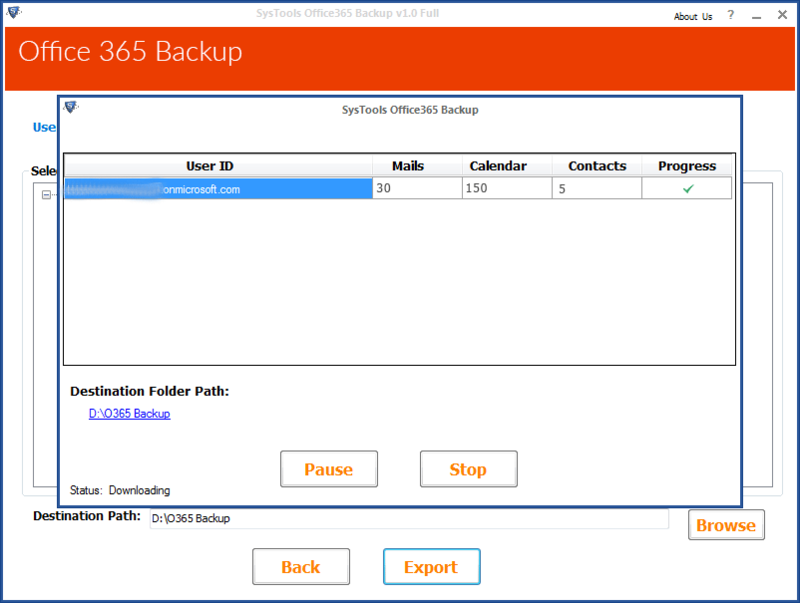 The Office 365 Backup software can archive or download Office 365 account data to the local server of the user easily. This application can save O365 contacts, calendars and all other files to a local system in EML file format without any data loss. The utility to Backup Office 365 domain supports all editions of Microsoft Windows Operating System namely, Windows 10, Windows 8.1, Windows 8, Windows &, Windows Vista etc. 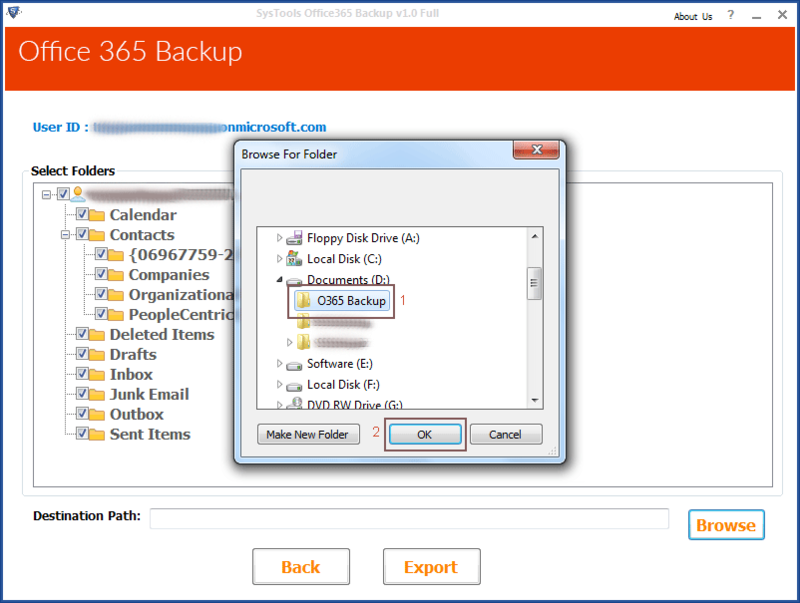 The Exchange Online backup application provides options to save single as well as multiple mailboxes of Microsoft Office 365 user account to local server. This utility allows application impersonation option to transfer multiple mailboxes from Office 365 domain by the admin. 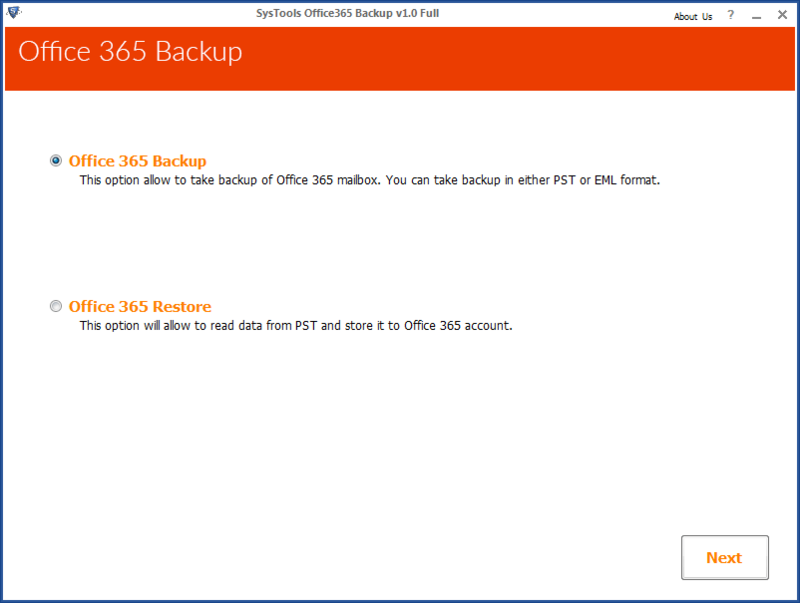 When archiving Exchange Online data to EML file format, the Office 365 backup software supports naming conventions to be chosen. That is, the users can specify the name to save the output generated. Even if Office 365 domain downloading is done in bulk one can chose this feature. This product saves all data in MS O365 and keeps the original folder hierarchy even after the data is archived from Office 365 to computer/ hard drive. This program can maintain meta properties of the file intact. That is, there will be no modification done on the original data style. 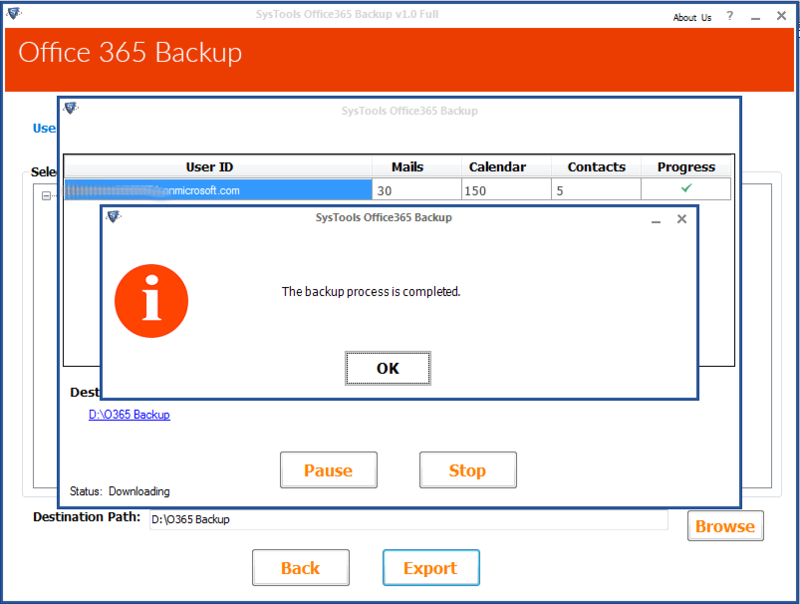 Office 365 Backup tool is helpful to manage the storage of Exchange Online account on a local machine/ Desktop. Filter option helps to filter out selective data i.e. to be downloaded based on given time or selected folder. How to Archive Office 365 account Using This Product? 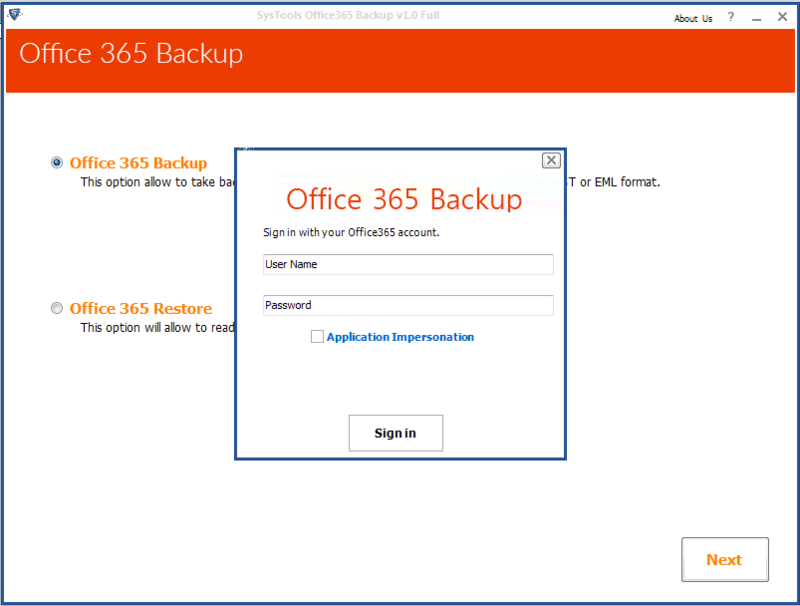 Step 1 : After installation Office 365 Backup Software, click on the Log in button for Login into Microsoft Office 365 Account. 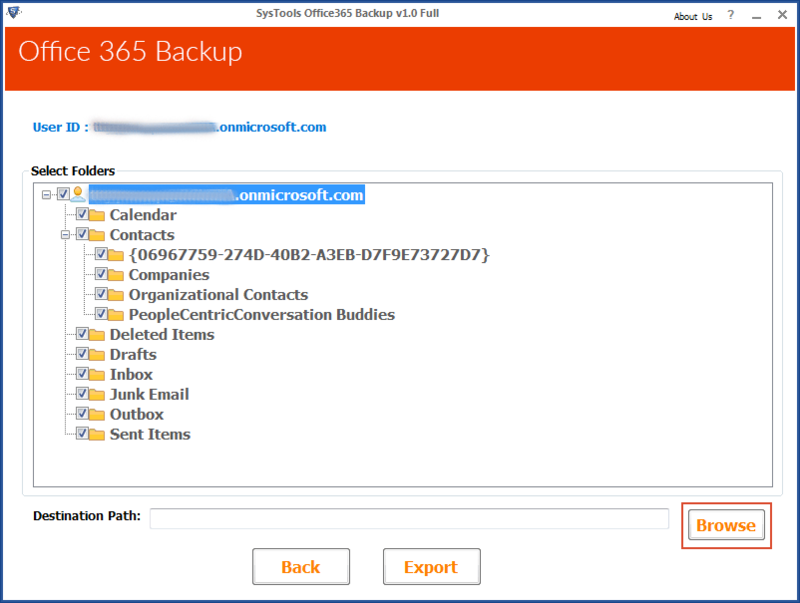 Step 3 : Select Office 365 Backup option to archive Office 365 content to local machine. Step 4 : Choose the particular item or items which you require to save from Office 365 account to local drive. Step 5 : Browse a location to save the copy of Office 365 data in the local system. Step 6 : After choosing location click on Export option. You can Select which ever file format you want and apply date filter if required. Q. 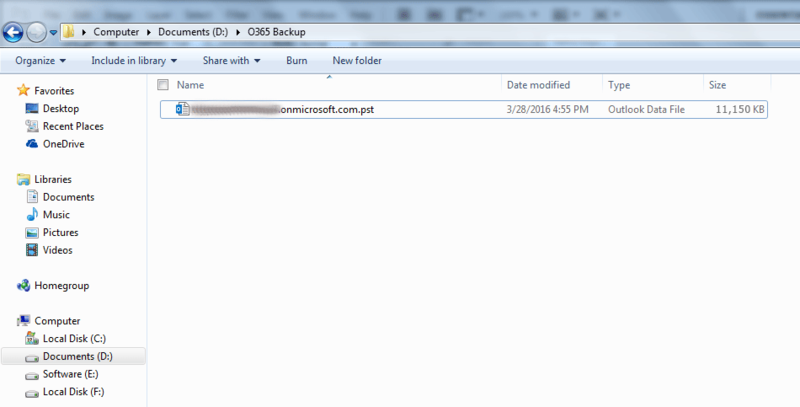 Is there any size limit of files to be downloaded by Office 365 Backup software? Ans: No, There are no size limit of backup file. The speed of data storing can be fixed by many factors, independent from the Office 365 archive tool itself, e.g. network bandwidth. Q. Can I archive Office 365 account data to local server? 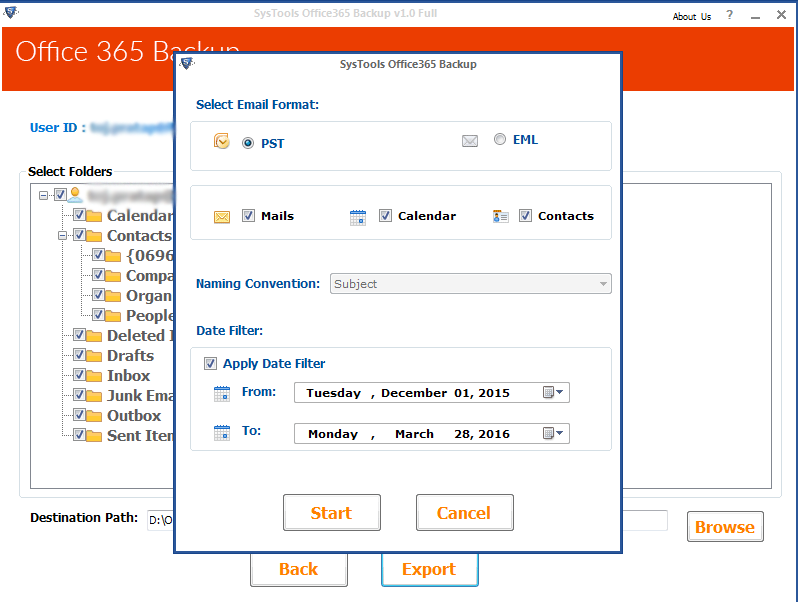 Ans: With this O365 archive utility, one can save Office 365 mailbox, contacts, calendars etc. easily at any time to your Hard-drive or Pen-drive. Q. How to copy calendar from office 365? Ans: With this software one can download any Office 365 files easily. you can take backup of your contacts, calendars & emails etc. For individually accessing calendar in O365, apply filter and choose calendars. Q. How can I check the tool before investing on this? Ans: We are presenting the Office 365 content Backup Software in two versions; Demo and Licensed copy. Using the Demo Version of the tool, you can easily test its capability and working before and be sure of spending on the right product to migrate Office 365 files into multiple file format. Full version will copy limitless Office 365 emails, contacts & calendar easily. Note: Office 365 Backup Software will get delivered on your registered email id, within few minutes after placing the order. We have assisted many users in our organization to use Office 365 full Backup software in a very short time period. The output obtained from archiving MS Office 365 account data is brilliant in terms of accuracy, speed and safety. This utility to download Office 365 files is one of the most valuable resource and it effectively helped us to save Office 365 account data. 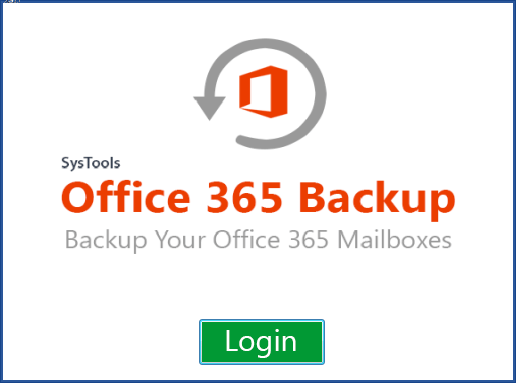 The Office 365 Backup Tool can automate time consuming tasks, work smarter, and perform in-depth analysis. It is an efficient application that keeps user happy, so that they can spend more time to reach their goal. Thanks to developer team! !